Weaving of ceremonial cloths ceased in Lampung, Sumatra at the end of the 19th century. This phenomenon of the extinction of a weaving culture is tragic irrespective of the textile group in question. But once we see the astounding beauty of the ceremonial textiles of Lampung, the tragedy takes on larger and very depressing proportions! These textiles now found only in museums and collections, once played a prominent role in every important family ceremony and were integrated into the customs of the all the people of Lampung across all social strata..
Today, the textiles that survive are few and the stories regarding their symbolism are even fewer. Over the decades that followed the earthquake, the traditions surrounding these ceremonial textiles were handed down from one generation to the next only verbally. And as in the game of chinese whispers, much of the information was lost over multiple transmissions. What we know today about this group of textiles are plausible reconstructions that have been put together by scholars and students and have been based on surviving fragments of cultural knowledge and the few surviving textiles. Why have so few textiles survived if they were so prevalent in the lives of the people of Sumatra? The answer to this takes us back into the traditions and rituals of Sumatra. In this region, textiles were at the heart of rituals and used as integral elements of ceremonies during births, deaths, weddings etc.. Their frequent usage subjected them to wear and tear. As these traditions lived on much after the weaving had stopped, families used ancestral pieces during rituals until the pieces could be used no more. And so, very few pieces survived in market-worthy condition. 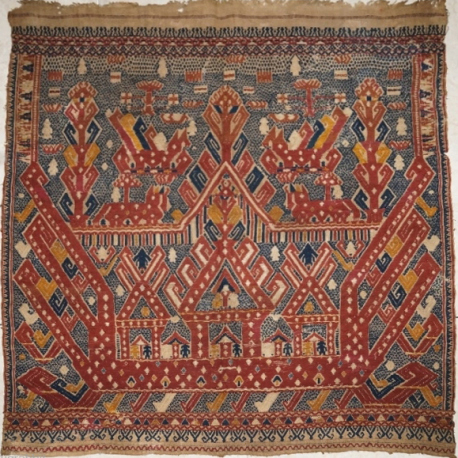 Today we have a vacuum not only of information about these textiles but also of pre-20th century Sumatran textiles. Thanks for the info! Good day! This entry was posted on November 9, 2013 by wovensouls in Art Kaleidoscope and tagged ancestral cloth, antique, antique art, Antique textile, art, Business, ceremonial cloth, lampung, old cloth, palepai, ritual, Sumatra, tamapn, Tatibin, textile, Textiles and Nonwovens, weaving, weft weaving.